I'm so glad you're here! Today I'm thrilled to participating in the Elements of Summer tour. 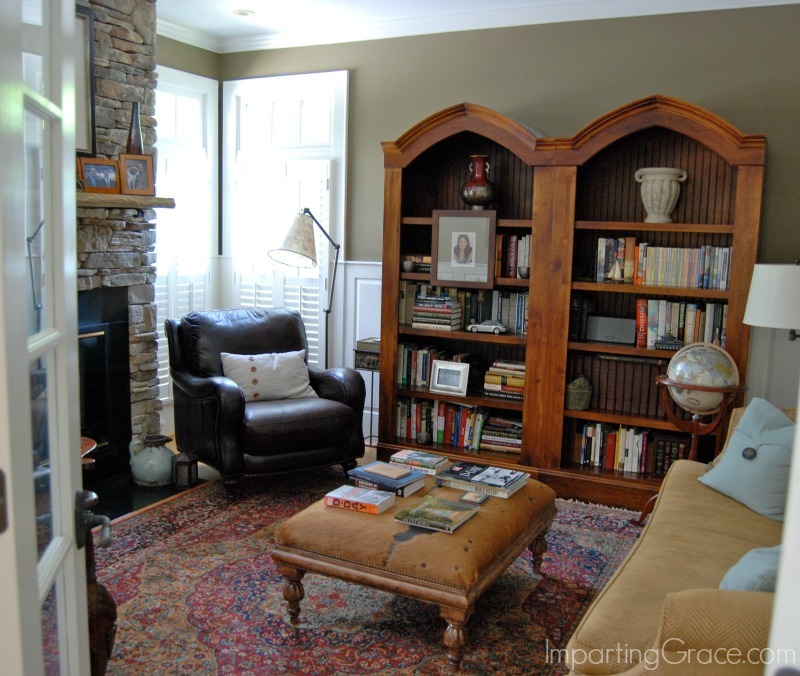 The Grace at Home link party will return next Thursday; for today, welcome to my home! The sun is shining, the flag is flying, and I'm so glad to welcome you. Early summer is one of my favorite times for a party--and one of the best things about a party is having the house all cleaned up and ready for guests, don't you think? I took advantage of my clean house and snapped some photos to share with y'all. First stop is the front porch, which is one of my favorite places in the house. We recently installed new ceiling fans out here, and it's so comfortable I could sit here all day. 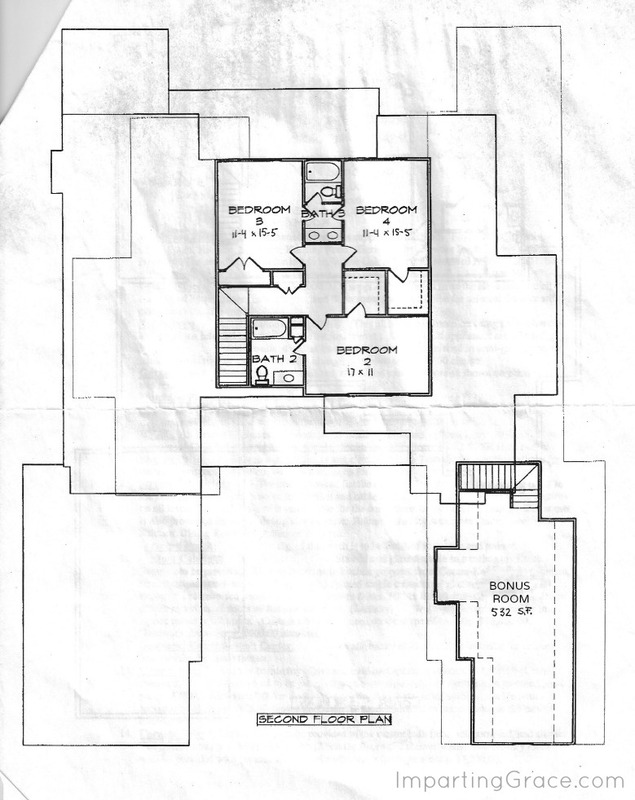 A number of people have asked me about the floor plan of our house. 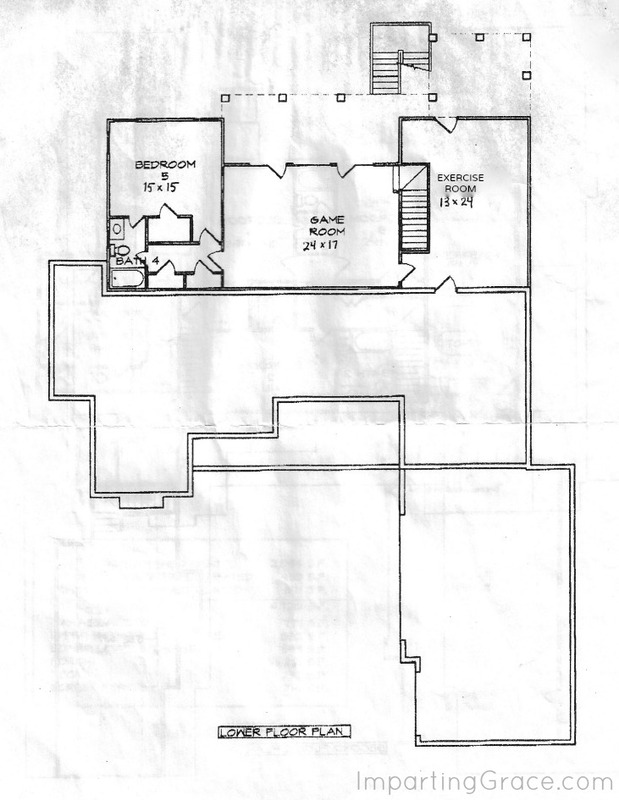 I don't have a good floor plan, but here's a rough sketch that will give you an idea of our space. Our house is built on a hill, so we have two stories in the front and three stories in the back. Now come on in and I'll show you around. As you can see from the floor plan and this photo, our foyer is quite a hub. Up those stairs are three bedrooms and two baths. Straight ahead is the living room; to the right is the dining room; to the left is a hall that leads to the powder room and a master suite. With all the traffic that goes through the foyer, I keep the decor here really simple. 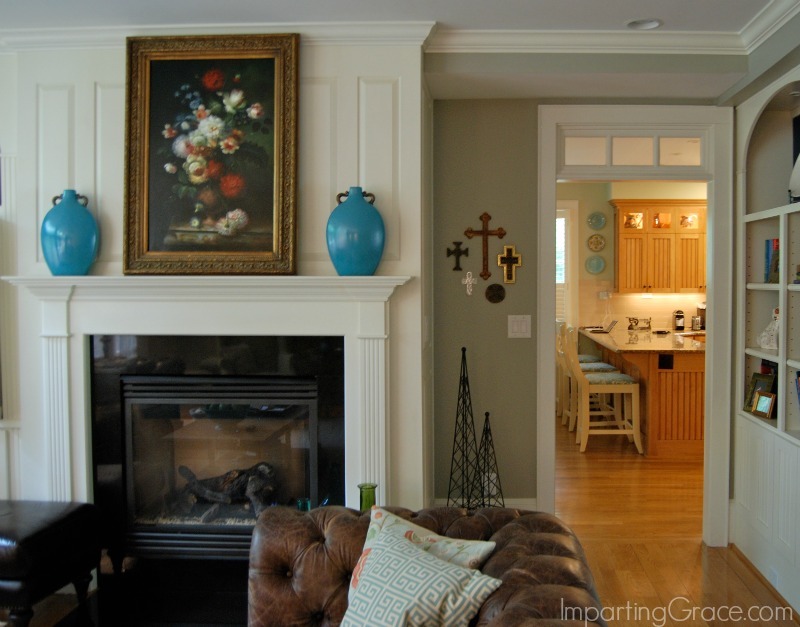 The walls are painted Sherwin Williams "Buckram Binding," which is a nice creamy neutral. 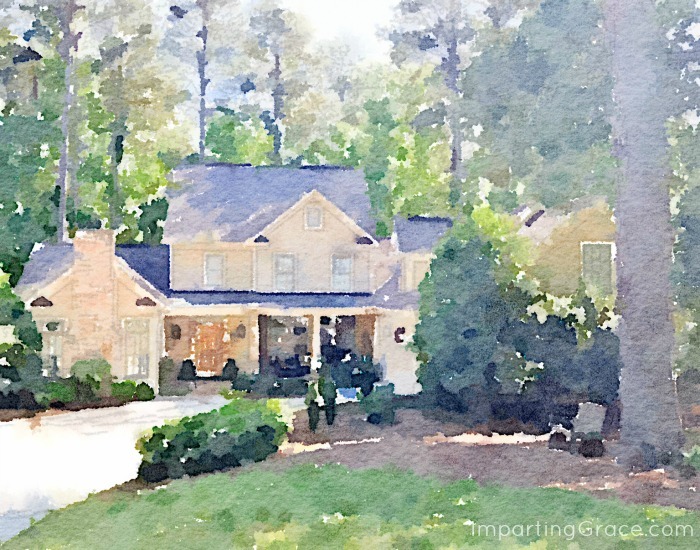 One of my favorite things in the foyer is the Waterlogue portrait of the house I created a few months ago. My husband's library is just to the left of the front stairs. 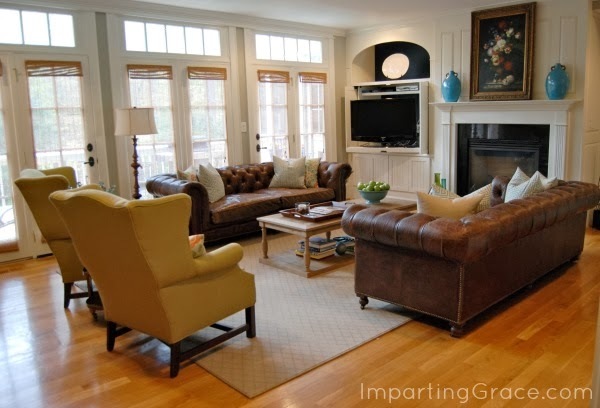 The decor in this room is very traditional, with the cowhide ottoman providing a nice playful touch. Jack is a military history buff. The reading materials out on the ottoman right now are all about D-Day. This week is the 70th anniversary of the invasion, you know. 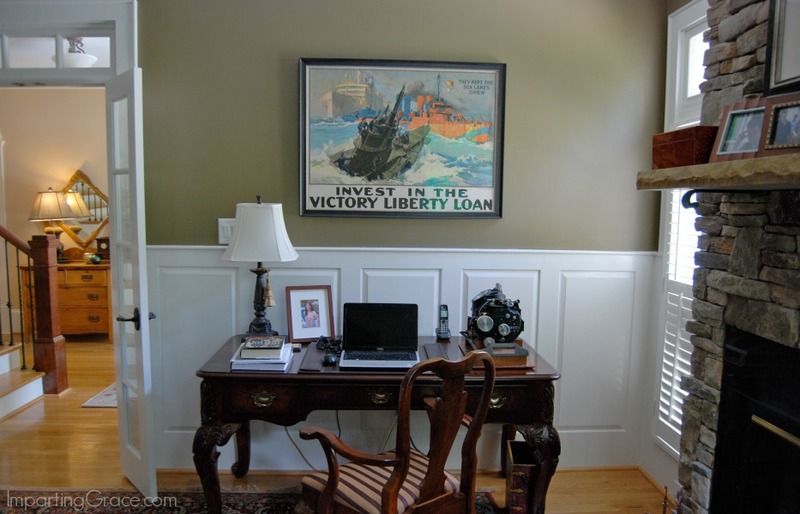 Over Jack's desk is a vintage war bond poster. And on his desk is the 50th birthday gift the boys and I gave to Jack: a World War II Norden bombsight We're such lovers of history. Also on the main floor is our master bedroom. I'm so grateful for this feature of our house. Right now we use all levels of this house, but after our kids have left home Jack and I could live on just this level if we ever needed to. Now to the living room, which we've been re-doing over the past year. It's still not completely finished, but we're enjoying its new look. 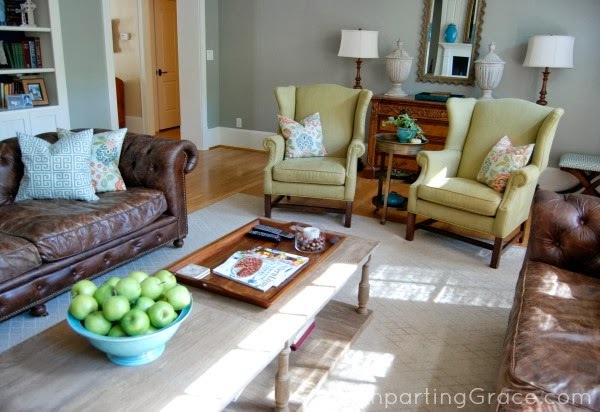 The wall color in this room is Benjamin Moore's Fieldstone, a greenish grey. It's a wonderful backdrop for this traditional but comfortable room. As you can see, the living room leads to the kitchen, which is also undergoing some changes. I've been wanting to create a lighter, brighter "farmhouse" look in this room, and I'm almost finished. I hope to share a full reveal of the updated kitchen in the next couple of weeks, but for now here's a peek. Looking from the workspace toward the eating area. This is a big room, and I love it when it's full of family and friends. We've fed a lot of people around that big table! The breakfast area leads out to the screened porch. As I said, our house is three stories in the back, so the screened porch is high off the ground. One of my favorite things about our neighborhood is all the trees; this room makes the most of that feature. Although the porch isn't large, it's big enough for an eating table and a small sitting area. Thanks so much for joining me for a look around my home! Here's to Summer 2014! 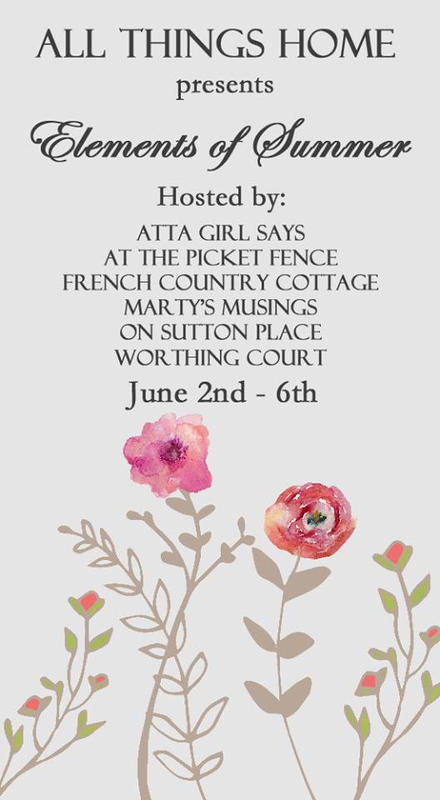 I'm so proud to be a part of the Elements of Summer event! There are lots of wonderful blogs featured in the Elements of Summer tour. You can visit them all! I've always loved your home, Richella. It looks especially pretty all dressed for summer! Looking forward to your kitchen reveal. What a gorgeous house! I especially love your screened in porch! Richella I always enjoy taking a tour of your beautiful home!! Your changes look so pretty! Simply beautiful, Richella. I am jealous of your trees! Thanks for the peek inside! It's all beautiful, Richella. 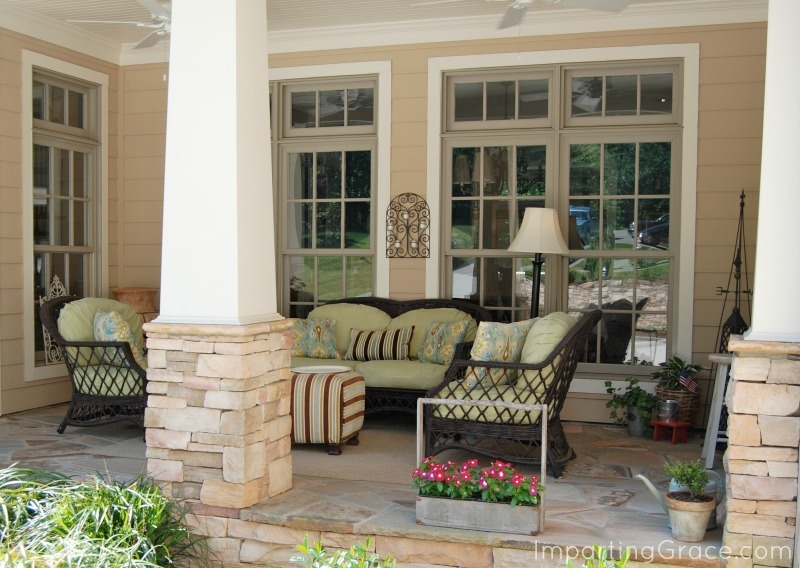 Love your front porch and screened porch. How nice to have two outside rooms. Omigosh I LOVE your home!!! Beautiful styling and decor, too. Richella, it is always such a treat to come tour your home, both the interior and exterior. Happy summer. Wow! You are a very very blessed woman. Your home is beyond beautiful. Richella, Your home is lovely! 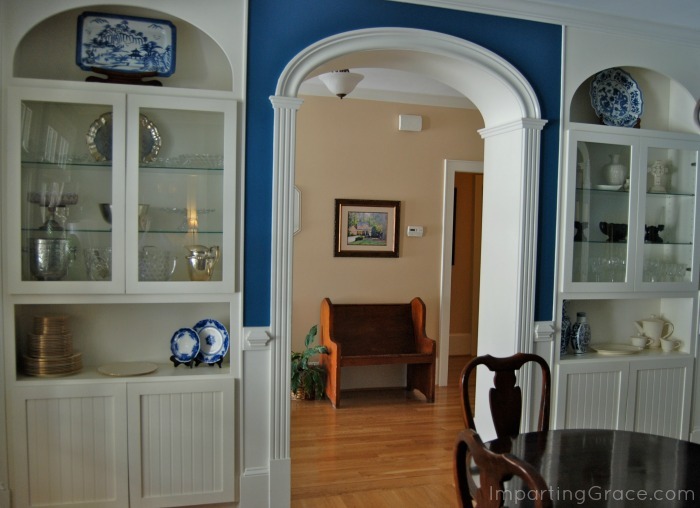 The blue on your dining room wall really caught my eye...beautiful color. Your home is just lovely! 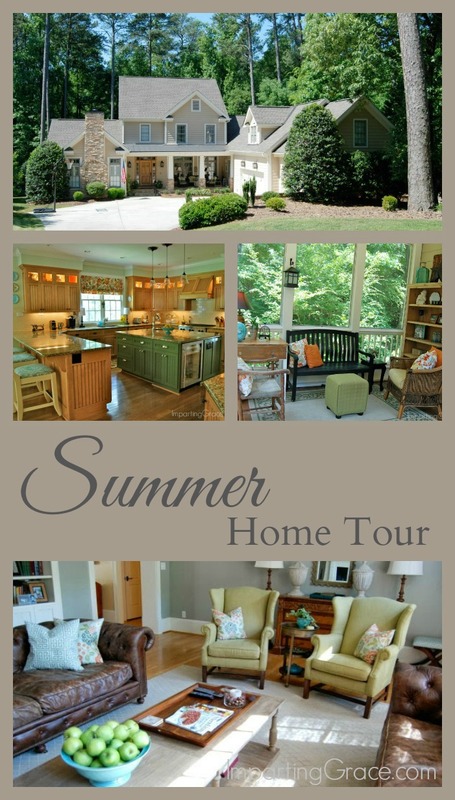 Thank you for inviting us in for a summery tour! Oh Richella, your home is beautiful! We've been endlessly looking for homes online and this is the type of home we hope to find. Thank you for sharing with us. Can't wait to come back next week and share a part of my home at the party. Richella, your home is gorgeous. And that Waterlogue print is simply fabulous! Great idea! I love your blog and your home as well. What a wonder place. 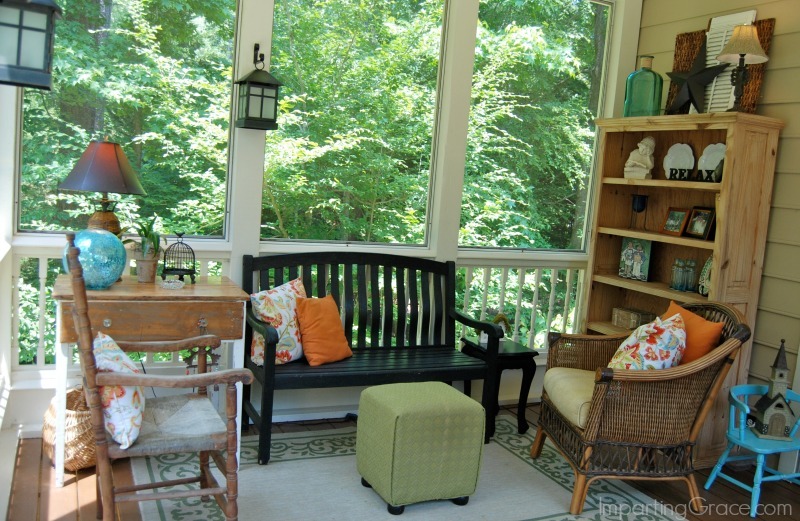 I love the sunroom and front porch - you would find me on one of those spots all of the time! Beautiful! Richella your home looks so very warm and welcoming. How fun that you have two porches on which to enjoy your beautiful outdoors in the warmer months. 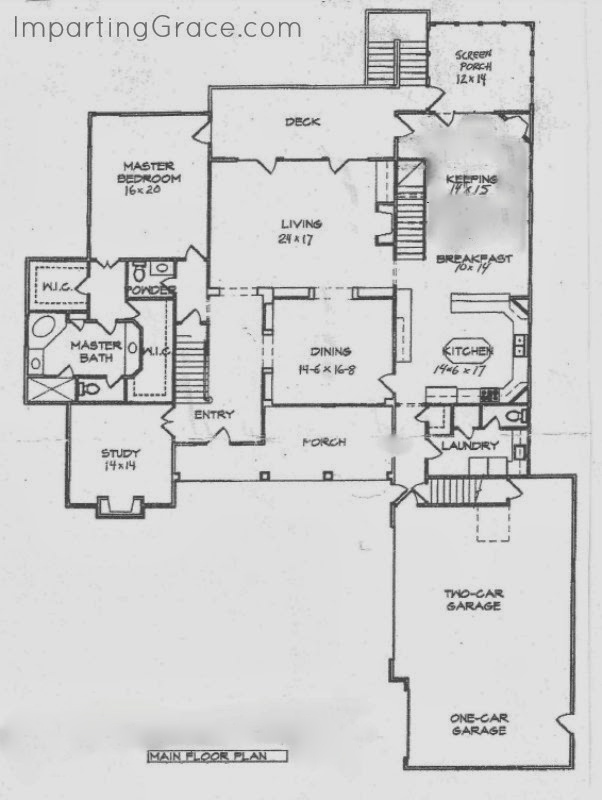 What a great floor plan for entertaining and exercising your gift of hospitality. Everything looks just gorgeous, as always and your updates look fantastic! Thank you for inviting us in! Lovely! Especially love the porch and those trees!! So inviting!! Richella, I always enjoy touring your beautiful home and seeing all of your lovely updates! Your home is so warm and inviting; and your porch areas just lure us in! I am sure your family and friends feel the love in your lovely home. Hi Richella...Your home is so lovely. I like how it keeps evolving...it is so elegant, and yet it always has that homey feel and such charm! It is perfect...yet I always like each change you make to it. :) It is the kind of home that should get passed down for generations...it is just that awesome... and so classic! I can imagine the future when your boys marry and bring their spouses to visit...and then when the grandchildren start coming along they will love exploring your fantastic home! They can pop into grandpa's office/den and explore the history books as they sit by the fire. Or they can help grandma cook in that fantastic kitchen! And they can have tea parties on the screened in porch, and invite their friends to sleepovers at Gramsie's house! :) When they get older they can chill out in the room above the garage and have their own space! Yes...it is a home that can host many Thanksgivings and Christmases...and it will give everyone the feeling of being "home" with family, and they will look forward to it every year. Hi Richella, I enjoyed your summer home tour, and I am in love with those matching Chesterfield leather sofas in your living room! 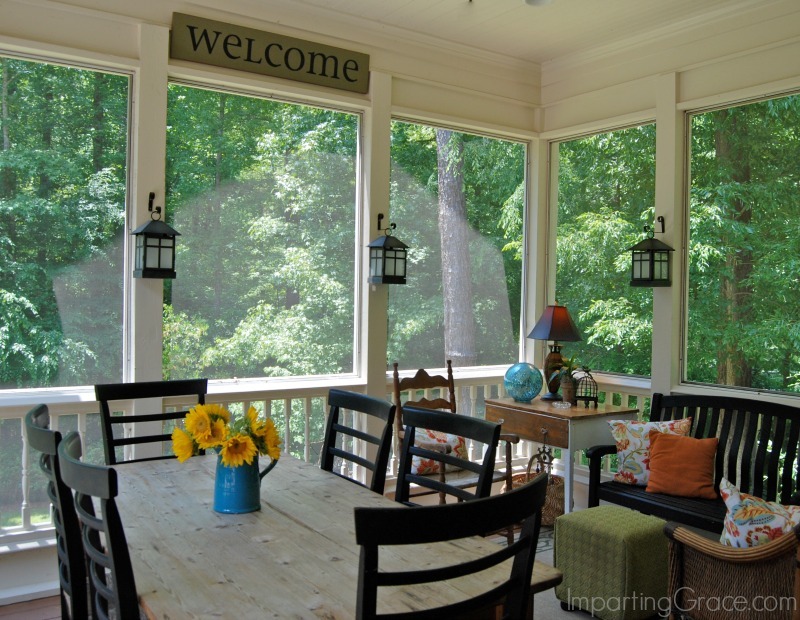 Love both of your porches along with that large table next to your kitchen! I always like having a crowd around the table! 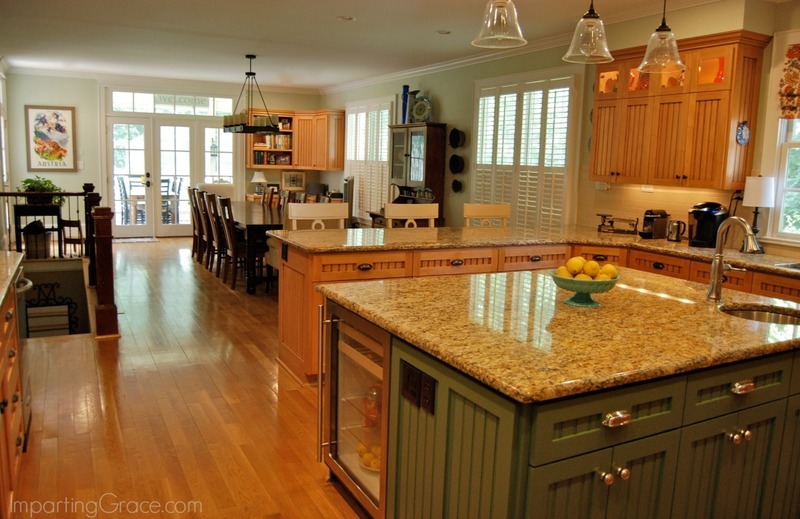 I love your house, especially the kitchen, and the screened in porch! Just lovely Richella! 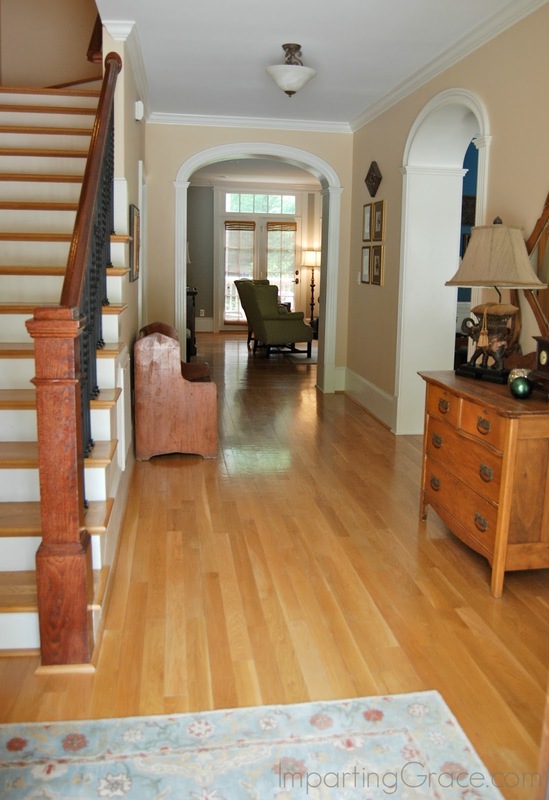 Everything says, "Welcome home" and so very tastefully decorated! Many blessings for you and your family in your beautiful home! 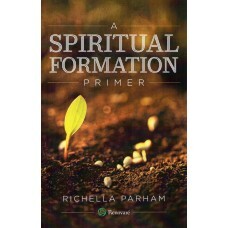 Richella, what a blessing to have such a beautiful home. I'm a porch girl and yours are just stunning!!! I've said it before and will say it again, I love everything about your home. You have the best taste and make it comfortable but at the same time elegant. Our husbands would have so much to talk about. Dave is also a history buff! The D Day Memorial isn't far from our house. You two should come up to see it. Beautiful Richella! Love your dining room blue walls! Richella your home is just so beautiful! I'll never forget the first time I saw it and how I just knew that you and I were kindred spirits. :-) It is warm and welcoming and elegant and is reflective of the beautiful family living there. So thrilled to be part of this fun series with you this week! Such a lovely and inviting home, Richella. I so appreciate all the personal touches that truly makes it "home." Thank you for sharing it with us. Wow! What an absolutely gorgeous house! The setting is just beautiful!! It's all gorgeous. Wow. Just a beautiful home. I love the kitchen! And the porch! So happy to see your summer tour. Your home is just beautiful! 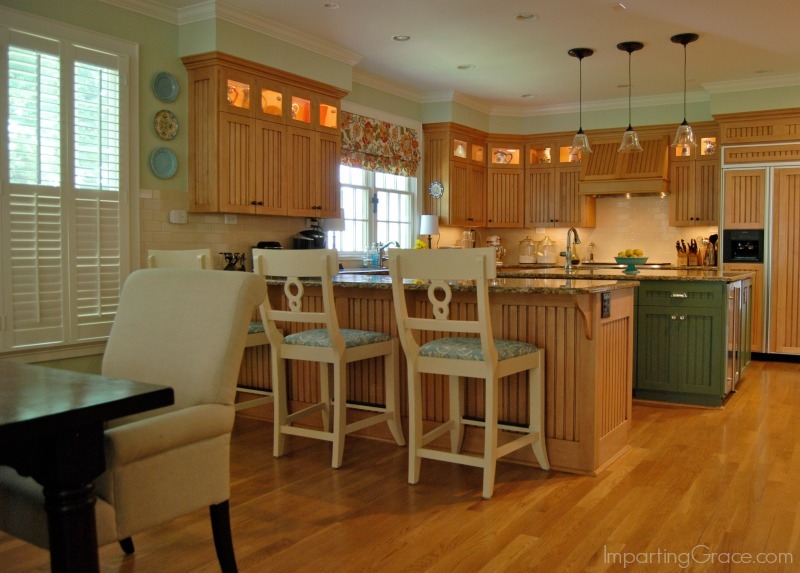 Love your kitchen cabinets and your pretty home decor and touches. Stunning from top to bottom! Richella, I've always thought your home was just incredible! The layout, the decor but especially your gift of hospitality, is so inviting. I know your friends and family love spending time there. Thanks so much for joining us on another tour! Maybe one day we can sit on one of your porches together! I always love seeing the changes you make gradually to your home. My favorite rooms are the living room and the porch! So, so great. What a beautiful home. Very welcoming!